The Polar RS300X heart rate monitor is an intermediate heart rate monitor with features specifically designed for running training. 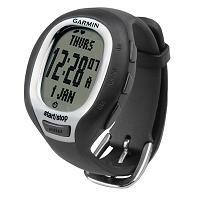 It replaces the very popular Polar RS200 and enhances it with two additional features (see the features bolded in the list below). Polar Fitness Test: You do the test and you get a score called OwnIndex (comparable to VO2 Max) measuring your cardiovascular fitness. The wrist watch saves 16 of the latest test scores. You will be able to see a bar chart of your fitness test scores. It also provides your Predicted Maximum Heart Rate which is expected to be more accurate than the age based formula (220 - age). There are 5 types of exercise that you can choose to do: Free, Basic, Interval, OwnZone and Custom. Free means exercise without a pre-set heart rate training zone. The other exercise types involve the use of heart rate zones/timers. There are 3 ways to use heart rate zone(s) in training: Manual heart rate zone, OwnZone automatic heart rate zone and the Polar Sport Zones (there are 5 of them). It is possible specify (up to) three segments (each with its own heart rate zone) to use in an exercise. Timer is set for each segment. The end result is a custom interval training plan. Data that can be displayed during training includes: heart rate, lap time, stop watch duration, sport zones, target heart rate zone. 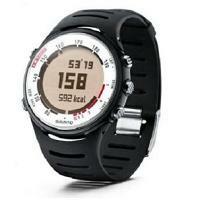 Note: Speed and distance data are displayed only with the use of the S1 foot pod or the G1 GPS sensor. The wrist watch stores lap and split time. Lap time is elapsed time for one lap. Split time is total elapsed time from the start. You can store up to 99 laps in total. You can also see your average heart rate in a given lap. Full post-exercise summary (File): Training session type, date, time started, duration, average heart rate, maximum heart rate, target zone(s) limits, time in, above, below target zone(s), calories burnt, time spent in each sport zone, detailed lap information as follows: total number of laps, average time per lap, best lap time and number. For each lap, you see the lap number, split time, lap time, average heart rate, maximum heart rate, heart rate at end of the lap. You can review the last 16 Files (exercise sessions). Weekly File. It adds up the sum total of stats for the week: Total calories burnt, total duration, and total time spent in each of the five Polar sport zones. Three exercise timers. Use them for running intervals. Basic time keeping: Time, date, alarm, 2 time zones. The alarm has following options: Once, Mon-Fri, Daily. Event Countdown: Set this to remind you of an event e.g. an upcoming race. Button lock: Manual or Automatic. HeartTouch: During training you can check selected information by simply bringing the wrist watch close the transmitter belt. It can be set to: Show Limits, Take Lap, Change View, and Light. Polar FlowLink (optional): This is an optional device that allows you to transfer training data between the wrist watch and a computer. Note that this is different to the Polar RS200, which uses WebLink/SonicLink to transfer data. Polar S1 foot pod (optional). 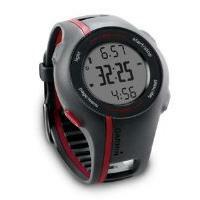 Read more on the Polar RS300X SD page. Polar G1 GPS sensor (optional). Read more on the Polar RS300X G1 page. The features highlighted in bold above are those found on the Polar RS300X but not on the Polar RS200. Thus it can be seen that the RS300X are very similar in specs to the Polar RS200, the main differences being that the RS300X can now be used with an optional GPS sensor and that the way data is transferred to a computer is also different, with the RS300X requiring an optional Polar FlowLink unit. Polar RX300X comes in 2 colors: Black and Orange. 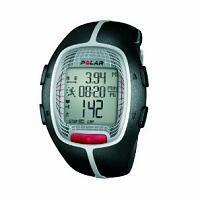 The Polar RS300X heart rate monitor is an excellent heart rate monitor for runners. 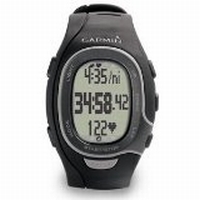 It caters for a wide range of runners from beginners to experienced competitive runners. It now incorporates optional GPS technology for those who wish to make use of it in their training. To incorporate speed and distance measurements, choose Polar RS300X SD (or alternatively Polar RS300X G1 ) heart rate monitor. The RS300X SD is effectively the Polar RS300X plus the Polar S1 Foot Pod. Similarly Polar RS300X G1 is just the Polar RS300X plus the Polar G1 GPS Sensor. The flexibility of the Polar RS300X system is one of its greatest strengths. You can get the Polar RS300X now, and if the need arises later, simply purchase either the S1 Foot Pod or the G1 GPS Sensor and everything will work just fine. The RS300X is a highly recommended heart rate monitor. 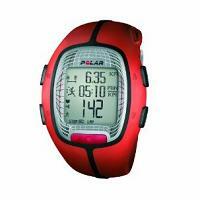 The next one up in Polar's RS series is the Polar RS400 heart rate monitor.